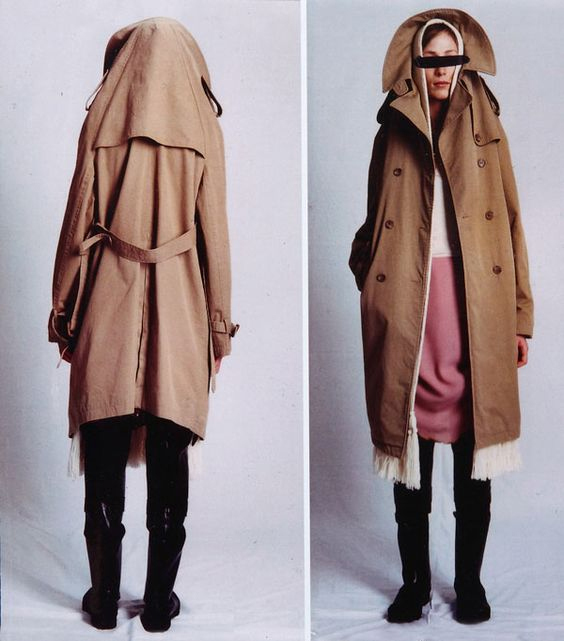 Maison Martin Margiela, Autumn Winter 2005-2006. the model is wearing a TRENCH COAT, EVOKING THE LOOK OF SOMEONE SHELTERING FROM THE RAIN UNDERNEATH THE COAT. THE NECK AND SHOULDER LINES HAVE BEEN ELONGATED SO THE COAT CAN BE WORN AS A HOOD. THE COAT CAN ALSO BE WORN AS A COLLAR, ENVELOPING THE SHOULDER.